Stavros Papadokonstantakis (Male) graduated with a BSc-MSc (Diploma) in Chemical Engineering from the National Technical University of Athens (NTUA), Greece, in 1998. He obtained his PhD from NTUA in 2006 in the area of “Modeling chemical processes using artificial neural networks”. Since 2007 he has held a senior research assistant position in the Safety and Environmental Technology Group in the Department of Chemistry and Applied Biosciences at the Swiss Federal Institute of Technology (ETH), Zurich. Since November 2014 he has been appointed as Associate Professor in the Industrial Energy Systems and Technologies Division in the Department of Energy and Environment at Chalmers University of Technology in Gothenburg. 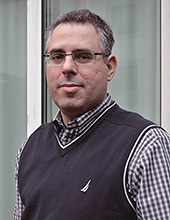 His current research focuses on process modelling and conceptual design coupled to key performance indicators and multi-criteria design decision making (i.e., combining techno-economic, LCA/LCC and SHE hazard analysis towards a holistic economic and environmental sustainability assessment of the production system life cycle), applied to biorefinery design and industrial symbiosis systems. Det kan finnas fler projekt där Stavros Papadokonstantakis medverkar, men du måste vara inloggad som anställd på Chalmers för att kunna se dem.